Solutions to Change: CPPR's social media presence on Blockathon makes a mark! CPPR's social media presence on Blockathon makes a mark! 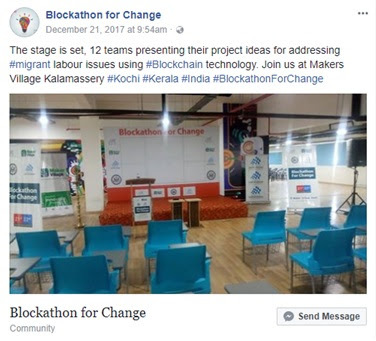 US Consulate General, Chennai; with Centre for Public Policy Research (CPPR), Maker Village and Kerala Startup Mission (KSUM) organized 'Blockathon for Change' to address the societal issues of migrant labourers using blockchain technology. Migrant labourers are often a disadvantaged and vulnerable group because of associated socio-economic and cultural issues. In India, massive interstate migration of labourers poses serious predicaments warranting immediate attention both at the ground level and policy level. The first-of-its-kind hackathon in India was designed to beneficially employ the blockchain technology for offering comprehensive solutions to mitigate problems related to migrant labour. While interning at CPPR, I got an opportunity to be a part of my first hackathon. I learned how social media platforms were extensively used to create buzz for the Blockathon and blockchain technology. CPPR used Twitter, Facebook and LinkedIn to provide information about the event, shared creative reveals of special guests at the event and established event’s hashtag- #BlockathonforChange. They posted countdowns to the event and creative images to motivate sharing. Before the event,behind-the-scenes pictures were shared to boost conversation and engagement. People used Facebook for sharing live videos of the sessions or tweeted key quotes from speakers. For more engagement feedback videos of the audiences and participants were also shared. When I shared the feedback video on my Facebook page many of my friends liked it and started to enquire about the event. It gave me a sense of pride and I felt special to be a part of the event. #BlockathonForChange was trending on Twitter, and it was a wonderful experience to be a part it. Through this event I not only learned about blockchain technology but importantly learned the relevance of social media.Thankful to CPPR for this wonderful learning journey via this BLOCKATHON!!! !